There is nothing hidden under the sun permanently. The surface of the earth can never be ignorant of even the smallest drops of rain in its horizons. It has come to the notice of IPOB writers about the murderous conspiratory master plan of the Northern Muslims Brotherhoods against the leader of the Indigenous People of Biafra, Mazi Nnamdi Kanu and Biafrans in general. Recall that during Jonathan's administration, some Boko Haram members were captured and imprisoned. And one of them is one Mr Usman by name, whom the Hausa- Fulani elders planned his escape from prison to Libya. With their full sponsorship through their Islamic state counterpart in Libya to learn and acquire IED precursor chemicals to aid them to advance and intensify their terrors, should Jonathan win 2015 election, But as God would have it, the Ex-president conceded defeat and their contingency plan was put on hold. From the information disclosed to IPOB writers from one of the Northerners, who, on a condition of anonymity, sympathizes with IPOB's leader and the Biafran struggle, revealed that that Mr Usman is back from Libya and has been reintegrated back into Bokoharam squad with another agenda to attack banks, prisons, market places, etc. with kuje prison being their major target, in the name of freeing their members that are still held 'captive' in prison, and in the process kill the brave and unapologetic leader of the Indigenous people of Biafra (IPOB) Nnamdi Kanu. He equally said that the Northerners are afraid over the circulating messages on the internet about 45 days given by US President Donald Trump to the Nigerian government to release all her political prisoners especially Nnamdi Kanu or face the consequences that would follow. So they have decided that Nnamdi Kanu will never leave kuje prison alive. At all cost, must be eliminated before the given 45 days ultimatum. 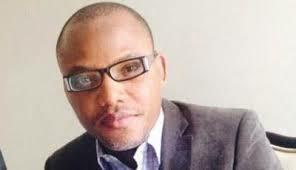 According to him releasing him is acceptance of the Biafran Republic. Now in a camouflage manner through the minister of information, the only professor of lies (in profession, in names and in practice), Mr Lai " Liar" Mohammed, the Nigerian government has lied as usual to the public that their intelligence has discovered the plans of Bokoharam trying to come and attack prisons, banks, marketplaces, etc. The public should be alert and be watchful and disclose any useful information about any suspicious movement of persons or group. This is meant to deceive the masses not to know that any attack from Bokoharam terrorist groups is their planned deal, should it happen as they planned it. But little did they know that it will be disastrous if anything happens to Nnamdi Kanu. "That prof. Yemi Osibanjo must ensure that Nigeria remains one at all cost. Therefore he is expected to ensure that the leader of Indigenous People of Biafra, Nnamdi Kanu is not released; and he is to uphold Buhari's methods of suppression and clampdowns on Biafra activists in the country". And they further threatened, should the Vice President fail to uphold their conditions, his administration shall be rendered ungovernable as was the case of former president, Goodluck Jonathan. These statements indeed synchronise with the above evil plans. However, recall that several attempts have been made by the Nigerian government to assassinate Mazi Nnamdi Kanu but all to no avail because of earlier detections via the help of our great God and IPOB's intelligence teams. From the plan of sending one of the Bokoharam inmates to kuje prison with a target to kill Nnamdi Kanu, to Chemical poison, to arrangement of assassins to attack the prison van on one of the courts' appearances, arrangement of a fatal accident while in the van on his way to court. It's very clear now that the Nigerian government has no case with Mazi Nnamdi Kanu who is exercising his universal law rights of self-determination which is not a crime. But instead of releasing him, they have vowed to kill him and Biafrans at all cost to keep Nigeria one. I wants to use this medium to alert the whole world, world leaders, world powers, USA, ISRAEL, RUSSIA, EU, UN, etc. to warn the Nigerian government and the Hausa-Fulani Northern Muslim elders about this crime the Northerners are about to execute: that if anything should happen to Mazi Nnamdi Kanu, Nigeria will be hotter than hell and of course inhabitable.